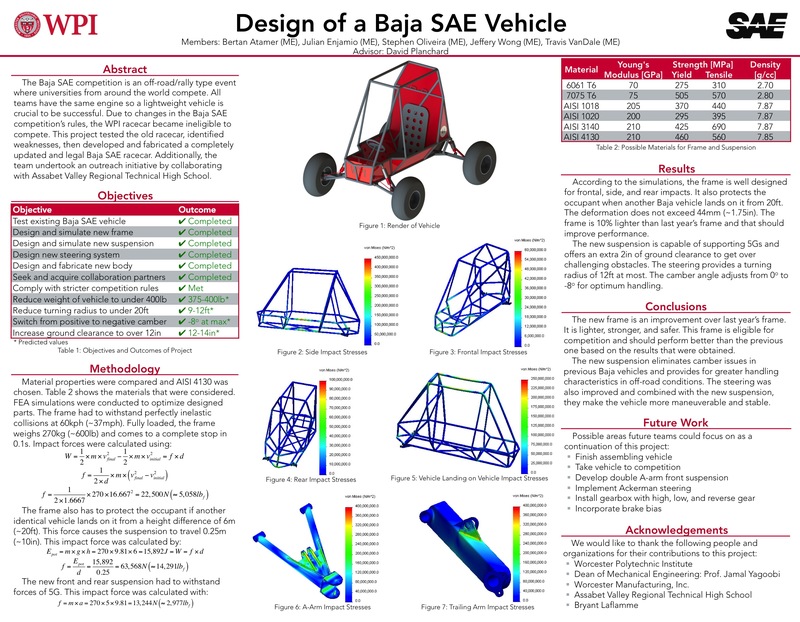 "2013-2014 WPI SAE Baja Vehicle" by Bertan Atamer, Jeffery Wilson Wong et al. WPI was developing a racecar for the Society of Automotive Engineers Baja (BSAE) competition. Due to changes in the competition’s rules, the WPI racecar became ineligible to compete. This Major Qualifying Project tested the BSAE racecar, identified deficiencies in its design, and then developed and fabricated an eligible BSAE racecar frame. The team also collaborated with Assabet Valley Regional Technical High School, where in exchange for fabricating the frame, the team educated the Assabet Valley shop students about the engineering principals behind the new racecar’s design. Finally, the team validated the new frame by utilizing finite element analysis software, preforming an SAE design review, and concluding with a comparison of the final deliverable to the previous BSAE frame design.